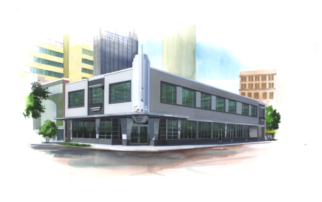 514 Franklin is a 20,000-SF renovation project for a 1950’s art-deco style mixed-use building in Downtown Tampa’s Central Business District. The building is located along the Franklin Street pedestrian mall. The preserving the original deco design was important to the building owners. The concept was to highlight the existing features with new bold elements and focal points to anchor the building on the street corner. The design addressed the pedestrian scale as well as the street scale. The building will have condo style units available for retail, restaurants on the first floor and office condos on the second floor. In 2004 Phil Alessi Jr. and his wife Amanda had a vision to open a restaurant rich with the traditional Italy flavors with a slightly modern twist. The initial plan was for a high-end fast food concept, but after 6 months the concept converted to a full service sit down restaurant with a five star appeal. The focal point of the restaurant is a large gas fired Wood Stone Oven which is used for a full range of cooking recipes which are unique to Alessi Wood Stone Oven. The restaurant sits over 90 guests. The kitchen includes all that is required for a full service restaurant, bakery and catering. 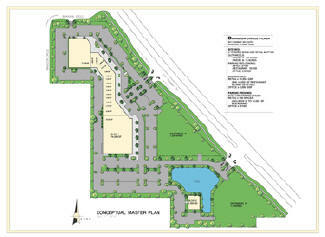 A 13-acre masterplan for a retail center with three (3) outparcels. The current concept plan has 74,554-GSF of retail and 5,000-SF of office use. The site is located off U.S. Highway 301 in the unincorporated Brandon area. A 12-acre masterplan phased for individual development concepts. 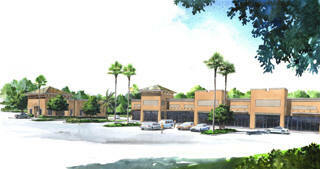 Initial phase includes a 14,000-SF multi-tenant retail building and a 4,500-SF stand alone bank or restaurant building. 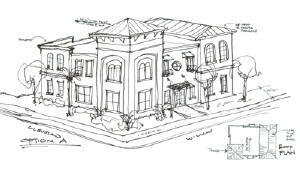 This 2-Story office building is 6,500-SF and is located in the South Tampa Historic District on Willow Ave. The building is a build-to-suit for a local attorney and is designed in a Mediterranean flair to fit in with the surrounding historic buildings and new townhouses. Our services included interior space planning and for the full 6,500-SF. The project design went through the City of Tampa City Council and Zoning approval process. This project is master planned in conjunction with Florida Engineering and Environmental Services for the placement and design of the site with a total of 172,900-GSF of industrial, flex space. The site is planned to have 5 buildings ranging from 28,500-SF to 38,000-SF. In 2004 Rick and Sonia Barcena purchased a building at 3437 W. Kennedy to move his renowned downtown Tampa restaurant into a centralized location. The building was an existing retail building which needed a lot of attention. The design challenge included an existing 1,000 square foot structure plus the addition of 300 square foot to convert it into a 47-seat Italian style restaurant. The kitchen includes all that is required for a full service restaurant and catering. Rigatoni Tuscan Oven has become a landmark in South Tampa. They have been selected as one of the best new restaurants in Florida by their delicious Italian and tantalizing Mediterranean cuisine. This 4-Story office building is 400,000-SF with a 2 level parking structure. 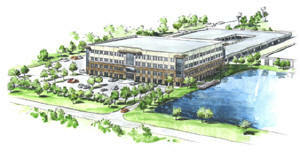 It is located adjacent to the existing Honeywell Campus off US 19 nest to an existing pond. The building is intended to serve a high tech call center or operations center for a large corporation or municipality.